Red swiss chard is not only pretty with its reddish color but I think it tastes great. I think it has a taste similar to beet greens. In this dish I used only the leaves. I chopped up the stems and saved them for another day. 1) Heat oil in a large pan or wok over medium high heat. Once the pan is hot add ginger and garlic. Saute for about 30 seconds to 1 minute. 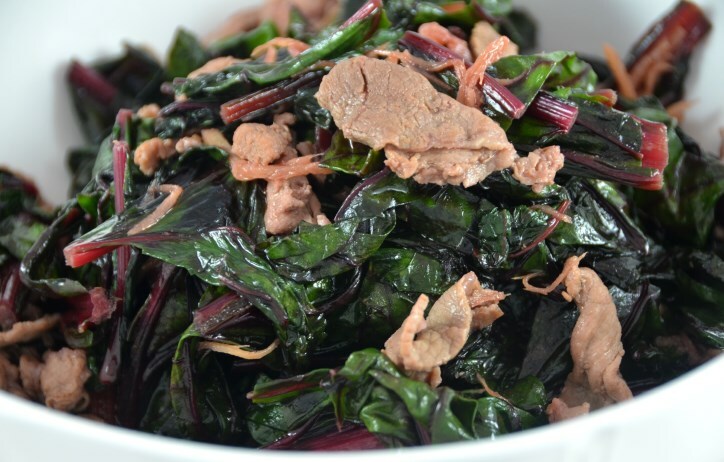 2) Add 1/2 of the swiss chard, stir and cover the pan or wok for about 1-2 minutes. 3) Once the leaves have wilted down a little add the rest of the swiss chard, stir and cover the pan or wok for another 2 minutes. 4) Uncover and stir. Once the leaves have wilted completely add the oyster sauce, fish sauce and sugar. Stir for another 1 minute.